Right before Christmas, Ryan woke up one morning with a fully body rash. After grilling him about what he ate at school the day before, thinking it was a delayed food allergy reaction, I made an appointment that morning with the pediatrician. She diagnosed him with Fifth disease, a virus that causes fully body rash in kids…and can cause rash, fatigue, joint pain and swelling in adults. I commented to our pediatrician how I’d been feeling fatigue like I’d never felt before, along with some malaise but no other symtpoms. She told me to watch out for the symptoms above. And lo and behold I broke out into the rash the following week, and also ended up super swollen hands, very sore ankles and knees for about 5 days. I felt very much like a leper with the rash…and very much like an 80 year old woman with severe arthritis. But I welcomed the time I got to spend resting on the couch, and I enjoyed the time I got to spend reading with the boys as well! I gave her about 15 warnings about this being a new cooking method, that I hadn’t tried before….and apologized 22 times in advance…in case it bombed. Well, apparently it didn’t bomb. This is part of the text exchange we had this morning. Apparently, it was the best ever…even after being reheated! 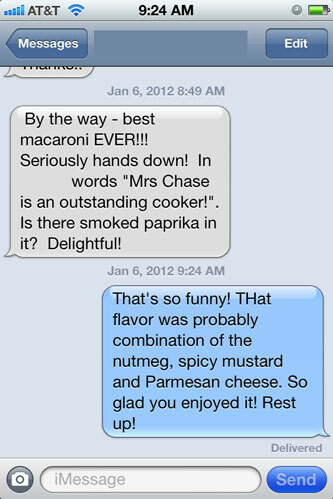 I only modified the recipe to make more to feed her hungry boys…and to use what I had on hand…. Check out all the great meal plans that Erin offers to help make your life a whole lot easier! In a medium saucepan, add the pasta, milk, mustard, garlic powder and nutmeg and turn on the heat on medium-high. Bring the milk to a simmer (just as you start seeing little bubbles form). Quickly turn it down to LOW. You don’t want the milk to heat too fast and boil over into a mess! Once the pasta is al dente, remove it from the heat and stir in the shredded cheese and Parmesan cheese. Serve immediately with favorite side dishes…fresh veggies or fruit! I tried making this a month ago and I must have done something wrong. The noodles were cooked, the taste was good, but the cheese didn’t melt well and was kind of grainy/gritty. Wondering if maybe the cheese you used was low/no fat – that could have caused both issues you had. We had Fifths Disease in our family last year. We call it Slapped Face Disease here in Texas because of the rosy cheeks! I thought our daughter’s teacher was joking when she said that…never heard of it! But my husband thought he has severe arthritis and it turned out to be this. I had Fifths Disease when I was pregnant. Luckily it didn’t affect the baby but I can So relate. The crippled hands were awful! You can’t open a door handle even. Glad you are over it and feeling better. Wow Amy! So glad to hear it didn’t affect your baby! The spicy mustard, nutmeg and garlic give it the perfect ‘smoky’ taste! It was delicious! Thanks for sharing!!!! Oh dear. I think I need to make this for lunch tomorrow!! Sounds delish! p.s. I know now since you tell use how to cook it, that the pasta listed in the ingredients starts out as uncooked. Made this for dinner tonight and turned out great. So easy and my 18 month old love it. I added in about 3/4 frozen peas towards the end of cooking and 1 tsp. tumeric. I wanted it more yellow so added in turmeric, did not affect the taste. Yummy and easy. Sounds great! Do you think this might work with gluten-free pasta as well? Say a small shell type variety? Just made this for my 2 year old twins. 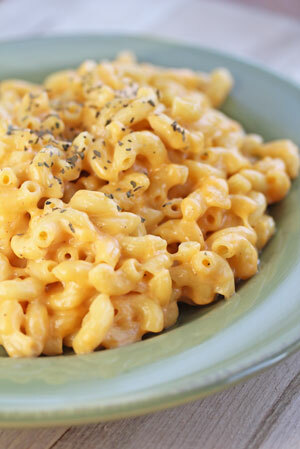 One of them already likes mac and cheese in any form (homemade or boxed). The other stopped eating it awhile back when I started trying some boxed varieties. Can’t say I blame her, I thought they were yucky too! She didn’t eat much, but she ate it! Number one ate 2 helpings. I would say this recipe is a keeper. Easy to make is an added bonus! I will add that mine turned out a bit dry. I did not add any additional liquid, so will try that next time.